About a year ago, violent storms hit the Houston area. When the floodwaters receded, Vroom, an online seller of used cars, discovered it had lost more than 100 vehicles, equal to about $3 million in sales. It was a reminder that the two-year-old Web startup faces some of the same challenges as a brick-and-mortar retailer. Vroom is one of several companies seeking to consolidate the fragmented used-car market. But unlike rivals Beepi, Shift Technologies, and Carvana, which mostly connect buyers and sellers via online marketplaces, New York-based Vroom buys all of its cars, then refurbishes and guarantees themmuch the way a traditional dealer does. Allon Bloch, the former venture capitalist who runs Vroom, says many Americans who are happy snapping up a $10 shirt online remain leery about going there to buy a car, typically the second-biggest purchase after a home. If a consumer spends tens of thousands of dollars on a car that theyll use for many hours every week and may own for years, we have to make sure the car is amazing both mechanically and cosmetically, says Bloch, who was a venture partner at VC firm Greylock Partners. Traditional chains such as CarMax have helped improve the used-car buying experience. But many consumers still dread walking onto a dealers lot. 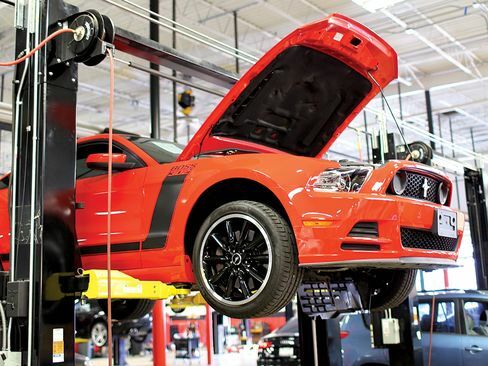 Vroom and other used-car e-tailers say they remove the hassle and hard sell. All offer haggle-free pricing, free delivery, and returns within a limited period. 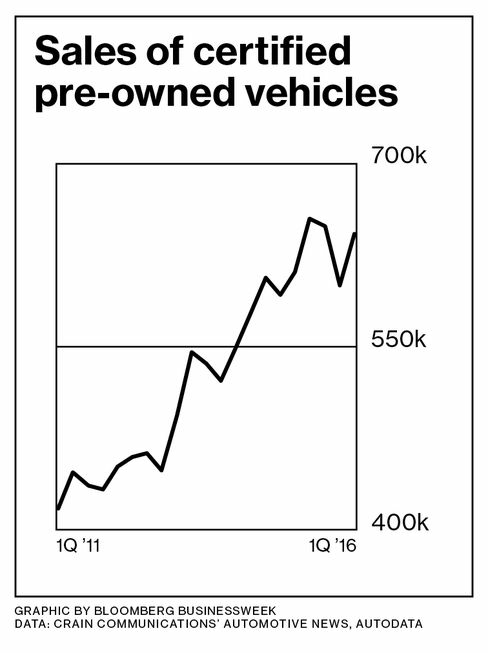 Americans buy 40 million pre-owned vehicles a year, yet CarMax, one of the largest players, has just 2 percent of the market. With plenty of room to grow, Vroom has raised more than $250 million in equity and debt from investors including General Catalyst Partners, Catterton, and John Elway, the former quarterback whos now general manager of the Denver Broncos, the 2015 Super Bowl champions. In 2015 investors poured more than $900 million into used-car e-tailers globally, almost double the amount from the prior year, according to CB Insights. Vroom is betting it can win over consumers by combining traditional dealership service with the robust selection online shoppers have come to expect. The company specializes in accident-free, low-mileage cars. Its hard to find anything on its website manufactured before 2013. There are more than 35 brandsincluding, recently, an Aston Martin and a few Teslas. Vroom developed its own logistics software to keep tabs on its inventory of as many as 4,000 vehicles. Bloch says the program helps the companys facilities in Dallas and Houston, where vehicles are inspected and prepped for sale, work as smoothly as a factory assembly line. Buyers get a 90-day warranty, seven days to return the car for a full refund, and one year of roadside assistance. Bloch says his prices are 8 percent lower on average than those of other dealers. After clicking Buy, a customer typically receives her car in less than a week. Vrooms two facilities process a few hundred cars a day, using algorithms to figure out which vehicles should be loaded onto which truck to be delivered where. The company farms out half the deliveries, but in the next 12 months, Bloch plans to bring the whole operation in-house, so Vroom can move to 24-hour delivery. Of course, that means buying trucks, hiring drivers, and adding facilities, including one opening this year in Indianapolis. Because its fixed costs are higher than most e-tailers and its prices are cheaper than those offered by traditional dealers, Vroom will need to move a lot of metal very efficiently to make money. The company says it sold tens of thousands of cars last year, generating about $900 million in revenue. Getting the cars out the door quickly is key, because their value depreciates every day they sit unsold. The longer it takes, says Bloomberg Intelligence analyst Kevin Tynan, the less Vroom makes and the less cash it has to buy more inventory or build out operations. Bloch declined to specify a timeline to profitability, saying the company is focused on investing in growth. In April, another flood hit Houston. At 6 a.m. on a Monday morning, about two dozen Vroom employees braved the rains to move vehicles to higher ground. To identify the most high-risk cars and their locations, the workers consulted newly tweaked software. This time, Vroom lost only about a dozen vehicles. The bottom line: Unlike rival marketplaces for used cars, Vroom buys and inspects all of the vehicles it lists for sale on its website.